Slope stability is always a very important topic in many developed and highly congested cities, particularly for many cities in China where slope failures have killed many people with significant loss of properties. The author has also participated in different types of slope stability research and consultancy works in different countries, and has published two books entitled “Soil Slope stability analysis and stabilization – new methods and insights” and “Frontier in civil engineering, vol.1, Stability analysis of geotechnical structures” which are well favoured by many students, engineers and researchers. The author also frequently receives email about the details of the more innovative slope stability analysis methods, stabilization and monitoring system, as well as the procedures in the numerical implementation of some of the stability analysis methods. In views of the various improvements in the theory of slope stability analysis over the years, the author would like to write a new book on slope stability analysis and slope reliability analysis, and the new materials will be useful to both students, engineers as well as researchers. In this book, different methods of slope stability analysis will be discussed in a broad sense. Following that, the limit equilibrium and finite element methods will be discussed in more details, as these two methods are the methods commonly used for practical works. Detailed procedures for limit equilibrium analysis will be provided to aid the students in learning, while the program SLOPE2000 will be introduced for the solution of more complicated problems. Some interesting engineering cases will be illustrated in this book. The author will also try to introduce the use of distinct element slope stability method, which is a technique still far from practical applications, but it does offer some insights which are not possible with the other methods. 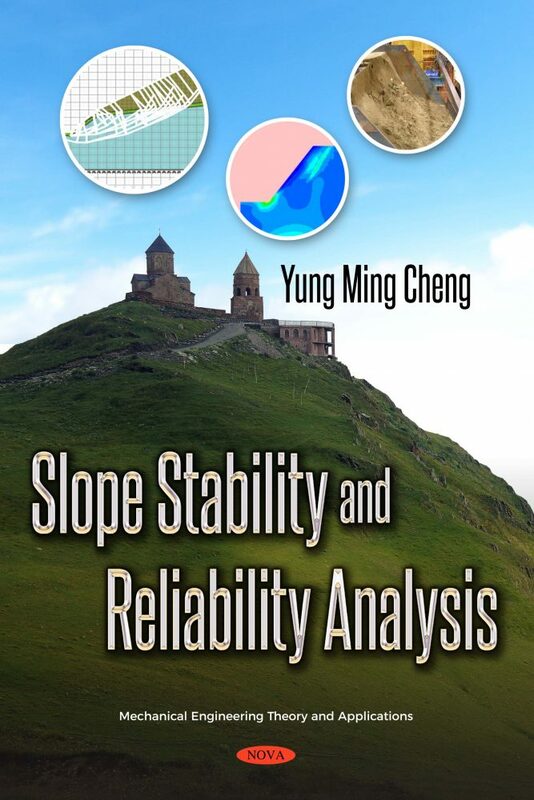 Following that, the author will introduce the importance of reliability slope stability analysis, which is an important issue for cities with complicated ground conditions and high water table. Due to the intensive computation required for reliability analysis, the author has proposed many improvements to various reliability assessment methods in order to maintain a balance between accuracy and time of computation. The central core of SLOPE 2000 and SLOPE 3D for two-dimensional and three-dimensional slope stability analysis as introduced in this book are developed mainly by the author, while there are many research personnel who have helped in various works associated with the research works. The authors would like to thank Yip C.J., Wei W.B., Li N., Li L. Li D.Z. and Liu L.L. for the helps in preparing parts of the works and the preparation of some of the figures in this book. Abramson L. W., Lee T. S., Sharma S. and Boyce G. M. (2002), Slope Stability and Stabilization Methods, 2nd edition, John Wiley. Adhikari S. (2004), Reliability analysis using parabolic failure surface approximation, Journal of Engineering Mechanics, 130(12): 1407-1427. Al-Defae A. H. and Knappett J. A. (2015), Newmark sliding block model for pile-reinforced slopes under earthquake loading, Soil Dynamics and Earthquake Engineering, vol.75:265-278. Alonso, E. (1976), Risk analysis of slopes and its application to slopes in Canadian sensitive clays, Geotechnique, 26(3):453-472. Alkasawneh W., Husein Malkawi A. I., Nusairat J. H. and Albataineh N. (2008), A comparative study of various commercially available programs in slope stability analysis, Computers and Geotechnics, 35(3):428-435. Anderheggen E. and Knopfel H. (1972), Finite element limit analysis using linear programming, International Journal of Solids and Structures, 8(12), 1413–1431. Andersen, K. D., Christiansen, E., Conn, A., and Overton, M. L. (2000), An efficient primal-dual interior-point method for minimizing a sum of Euclidean norms, SIAM Journal on Scientific computing, 22(1), 243-262. Ang A. H. and Tang W. (1984), Probability concepts in engineering planning and design, vol.2, John Wiley and Sons Inc. New York. Arai K. and Tagyo K. (1985), Determination of noncircular slip surfaces giving the minimum factor of safety in slope stability analysis, Soils and Foundations, 25, 43–51. Assadi A. and Sloan S. W. (1990), Undrained stability of shallow square tunnel, Journal of the Geotechnical Engineering Division, ASCE, 117(8), 1152–1173. Au S. K. and Beck J. L. (2001), Estimation of small failure probabilities in high dimensions by subset simulation, Probabilistic Engineering Mechanics, 16(4): 263–277. Au S. K. and Beck J. L. (2003), Subset simulation and its application to seismic risk based on dynamic analysis. Journal of Engineering Mechanics, 129(8): 901–917. Au S. K., Ching J. and Beck J. L. (2007). Application of subset simulation methods to reliability benchmark problems, Structural Safety, 29(3): 183–193. Au S. K., Cao Z. J. and Wang Y. (2010), Implementing advanced Monte Carlo simulation under spreadsheet environment, Structural Safety, 32(5): 281–292. Baecher G. B. (1987), Statistical analysis of geotechnical data, USACE Waterways Experiment Station, Vicksburg, Mississippi. Baecher G. B. and Christian J. T. (2003), Reliability and statistics in geotechnical engineering, John Wiley. Baecher G. B. and Ingra T. S. (1981), Stochastic FEM in settlement predictions, Journal of the Geotechnical Engineering Division, ASCE, 107(4): 449-463. Babuska I. and Miller A. D. (1978), A posteriori error estimates for the finite element method, International Journal for Numerical Methods in Engineering, 12(10), 1597-1615. Babuska I. and Rheinboldt W. C. (1979), Analysis of optimal finite-element meshes in R, Mathematics of Computation, 33(146), 435-463. Babuska I. and Miller A. D. (1987), A feedback finite-element method with a posteriori error estimation. 1. the finite-element method and some basic properties of the a posteriori error estimator, Computer Methods in Applied Mechanics and Engineering, 61(1), 1-40. Baker R. and Garber M. (1977), Variational Approach to Slope Stability, Proceedings of the 9th International Conference on Soil Mechanics and Foundations Engineering, Tokyo, Vol. 2, pp. 9–12. Baker R. and Garber M. (1978), Theoretical analysis of the stability of slopes, Geotechnique, 28, 395–411. Baker R (1980), Determination of the critical slip surface in slope stability computations, International Journal of Numerical and Analytical Methods in Geomechanics, 4:333-359. Baker R. (2003), Sufficient conditions for existence of physically significant solutions in limiting equilibrium slope stability analysis, International Journal of Solids and Structures, vol. 40(13-14), 3717-3735. Baker R. (2005), Variational slope stability analysis of materials with non-linear failure criterion, Electronic Journal of Geotechnical Engineering. Volume 10, Bundle A.
Baligh M. M. and Azzouz A. S. (1975), End effects on the stability of cohesive soils, Journal of the Geotechnical Engineering Division, ASCE, 101(GT11), 1105–1117. Bandini P. (2003), Numercial limit analysis for slope stability and bearing capacity calculations, PhD thesis, Purdue University, West Lafayette. Bauer S. and Lackner R. (2015), Gradient-based adaptive discontinuity layout optimization for the prediction of strength properties in matrix–inclusion materials, International Journal of Solids and Structures, vol.63:82-98. Belegundu A. D. and Chandrupatla T. R. (1999), Optimization Concepts and Applications in Engineering, Upper Saddle River, NJ: Prentice Hall. Bey J. (1995), Tetrahedral grid refinement, Computing, 55(4), 355-378. Bhattacharya G., Jana D., Ojha S. and Chakraborty, S. (2003), Direct search for minimum reliability index of earth slopes, Computers and Geotechnics, 30, 445–462. Birolini A (2014), Reliability engineering, 7th edition, Springer. Bishop A. W. (1955), The use of the slip circle in the stability analysis of earth slopes, Geotechnique, 5(1), 7–17. Bolton M. D. and Lau C. K. (1993), Vertical bearing capacity factors for circular and strip footings on a Mohr–Coulomb soil, Canadian Geotechnical Journal, 30(6), 1024–1033. Booker J. R., Zheng X. (2000), Application of the theory of classical plasticity to the analysis of the stress distribution in wedges of a perfectly frictional material, Modelling in Geomechanics, John Wiley, New York. Borges L., Feijoo R. and Zouain N. (1999), A directional error estimator for adaptive limit analysis, Mechanics Research Communications, 26(5), 555-563. Borges L., Zouain N., Costa C. and Feijoo R. (2001), An adaptive approach to limit analysis, International Journal of Solids and Structures, 38(10-13), 1707-1720. Bolton H. P. J., Heymann G. and Groenwold A. (2003), Global search for critical failure surface in slope stability analysis, Engineering Optimization, 35(1), 51–65. Bottero A., Negre R., Pastor J. and Turgeman S. (1980), Finite element method and limit analysis theory for soil mechanics problems, Computer Methods in Applied Mechanics and Engineering, 22, 131–149. Breitung K. (1984), Asympotic approximations for multinormal integrals, Journal of Engineering Mechanics, 110(3):357-366. Brenner S. C. and Scott L. R. (2008), The mathematical theory of finite element methods, New York: Springer. Buhan P. De and Garnier D. (1988), Three dimensional bearing capacity analysis of a foundation near a slope, Soils and Foundations, 38(3):153-163. Bui, H. H. (2007), Lagrangian Mesh-free Particle Method (SPH) for Large Deformation and Post-failure of Geomaterial using Elasto-plastic Constitutive Models, Ph.D. Dissertation, Ritsumeikan University, Japan,170. Bui H. H., Sako K., Satomi T. and Fukagawa R. (2008), Numerical simulation of slope failure for mitigation of rainfall induced slope disaster of an important cultural heritage, Proc. of Urban Cultural Heritage Disaster Mitigation, Vol.2, 111-118. Bui H. H., Fukagawa R., Sako K. and Okumura Y. (2010), Earthquake induced slope failure simulation by SPH, Fifth International conference on recent advances in geotechnical earthquake engineering and soil dynamics and symposium in Honour of Professor I.M. Idriss, San Diego, paper 4.53b, 1-9. Bui H. H., Fukagawa R., Sako K. and Wells J. C. (2011), Slope stability analysis and discontinuous slope failure simulation by elasto-plastic smoothed particle hydrodynamics, Geotechnique 61(7):565-574. Burland, J. B., Longworth, T. I., and Moore, J. F. A. (1977), Study of ground movement and progressive failure caused by a deep excavation in Oxford clay. Geotechnique, 27(4), 557-591. Castilo E. and Luceno A. (1980), Evaluation of variational methods in slope analysis. Proceedings of International Symposium on Landslides, New-Delhi, India, Vol. 1, pp. 255–258. Castilo E. and Luceno A. (1982), A critical analysis of some variational methods in slope stability analysis. International Journal for Numerical and Analytical Methods in Geomechanics, 6, 195–209. Cavicchi, A., and Gambarotta, L. (2006), Two-dimensional finite element upper bound limit analysis of masonry bridges, Computers & Structures, 84(31-32), 2316-2328. Cavounidis S. (1987), On the ratio of factors of safety in slope stability analyses, Geotechnique, 37(2), 207–210. Celestino T. B. and Duncan J. M. (1981), Simplified Search for Non-Circular Slip Surface, Proceedings of 10th International Conference on Soil Mechanics and Foundation Engineering, Stockholm, Sweden, pp. 391–394. Chang M. (2002), A 3D slope stability analysis method assuming parallel lines of intersection and differential straining of block contacts, Canadian Geotechnical Journal, 39(4), 799–811. Chan P. S. (1999), Distinct element slope stability analysis, master thesis, Hong Kong Polytechnic University. Chatterjee A. and Siarry P. (2006), Nonlinear inertia weight variation for dynamic adaptation in particle swarm optimization, Computers and Operations Research, 33, p.859–871. Chen Z. (2003), Stability analysis of soil slopes: theories, methods and programs, Water Power Press, Beijing (in Chinese). Chen J. (2004), “Slope Stability Analysis Using Rigid Elements”, PhD thesis, Hong Kong Polytechnic University. Chen R.H. and Chameau J.L. (1982), Three-dimensional limit equilibrium analysis of slopes, Geotechnique, 32(1), 31–40. Chen S. S., Liu Y. H. and Cen Z. Z. (2008), Lower-bound limit analysis by using the EFG method and non-linear programming, International Journal for Numerical Methods in Engineering, 74(3), 391-415. Chen W. F. (1975), Limit Analysis and Soil Plasticity, USA: Elsevier. Chen W. F. and Giger M. W. (1971), Limit analysis of stability of slopes. Journal of the Soil Mechanics and Foundations Division, Proceedings of the American Society of Civil Engineers, Vol. 97, pp. 19–26. Chen W. F. and Liu X. L. (1990), Limit analysis in soil mechanics, New York, Elsevier. Chen Z. Y. (1992), Random trials used in determining global minimum factors of safety of slopes, Canadian Geotechnical Journal, 29(2), 225–233. Chen Z. Y. (1998), On Pan’s principles of rock and soil stability analysis, Journal of Tsinghua University (Sci & Tech), 38, 1–4 (in Chinese). Chen Z. Y. and Morgenstern N. R. (1983), Extensions to generalized method of slices for stability analysis, Canadian Geotechnical Journal, 20(1), 104–109. Chen Z. and Shao C. (1983), Evaluation of minimum factor of safety in slope stability analysis, Canadian Geotechnical Journal, 25(4), 735–748. Chen Z. Y., Wang X. G., Haberfield C., Yin J. H. and Wang Y. J. (2001a), A three- dimensional slope stability analysis method using the upper bound theorem. Part I: Theory and methods. International Journal of Rock Mechanics and Mining Sciences, 38(3), 369–378. Chen Z. Y., Wang J., Wang Y. J., Yin J. H. and Haberfield C. (2001b), A three-dimensional slope stability analysis method using the upper bound theorem. Part II: Numerical approaches, applications and extensions. International Journal of Rock Mechanics and Mining Sciences, 38(3), 379–397. Cheng Y. M. (1998), Advancement and improvement in discontinuous deformation analysis, Computers and Geotechnics, 22(2), 153–163. Cheng Y. M. (2002), “Slip Line Solution and Limit Analysis for Lateral Earth Pressure Problem, the Ninth Conference on Computing in Civil and Building Engineering”, April 3-5, Taipei, Taiwan, p.311-314. Cheng Y. M. (2003a), Locations of critical failure surface and some further studies on slope stability analysis, Computers and Geotechnics, 30(3), 255–267. Cheng Y. M. (2003b), Seismic lateral earth pressure coefficients by slip line method, Computers and Geotechnics, vol. 30 no.8, p.661-670. Cheng Y. M. (2007), Global optimization analysis of slope stability by simulated annealing with dynamic bounds and Dirac function, Engineering Optimization, 39(1), 17–32. Cheng Y. M. and Zhang Y. H. (2000), Rigid body rotation and internal block discretization in DDA analysis, International Journal for Numerical and Analytical Methods in Geomechanics, 24, 567–578. Cheng Y. M. and Zhang Y. H. (2002), Coupling of FEM and DDA methods, International Journal of Geomechanics, 2(4), 503–517. Cheng Y. M. and Zhu L. J. (2004), Unified formulation for two dimensional slope stability analysis and limitations in factor of safety determination, Soils and Foundations, 44(6), 121–128. Cheng Y. M. and Au S. K. (2005a). Slip line solution of bearing capacity problems with inclined ground, Canadian Geotechnical Journal, 42:1232-1241. Cheng Y. M., Liu H. T., Wei W. B. and Au S. K. (2005b), Location of critical three- dimensional non-spherical failure surface by NURBS functions and ellipsoid with applications to highway slopes, Computers and Geotechnics, 32(6), 387–399. Cheng Y. M. and Yip C. J. (2007a), Three-dimensional asymmetrical slope stability analysis – Extension of Bishop’s, Janbu’s, and Morgenstern–Price’s techniques, Journal of Geotechnical and Geoenvironmental Engineering, 133(12), 1544–1555. Cheng Y. M., Lansivaara T. and Wei W. B. (2007b), Two-dimensional slope stability analysis by limit equilibrium and strength reduction methods, Computers and Geotechnics, 34, 137–150. Cheng Y. M., Li L. and Chi S. C. (2007c), Studies on six heuristic global optimization methods in the location of critical slip surface for soil slopes, Computers and Geotechnics, 34(6), 462–484. Cheng Y. M. and Hu Y. Y., Wei W. B. (2007d), General axisymmetric active earth pressure by method of characteristic – theory and numerical formulation, Journal of Geomechanics, ASCE, 7(1):1-15. Cheng Y. M. and Li. L. (2007e), Particle swarm optimization algorithm for non-circular failure surface in two dimensional slope stability analysis, Computers and Geotechnics, 34(2):92-103. Cheng Y. M., Lansivaara T. and Siu J. (2008a), Impact of convergence on slope stability analysis and design, Computers and Geotechnics, 35(1), 105–113. Cheng Y. M., Liang L., Chi S. C. and Wei W. B. (2008b), Determination of the critical slip surface using artificial fish swarms algorithm, Journal of Geotechnical and Geoenvironmental Engineering, 134(2), 244–251. Cheng Y. M., Li L., Lansivaara T., Chi S. C. and Sun Y. J. (2008c), Minimization of factor of safety using different slip surface generation methods and an improved harmony search minimization algorithm, Engineering Optimization, 42(2), 95-115. Cheng Y. M., Liu Z. N., Song W. D., Au S. K. (2009), Laboratory test and Particle Flow Simulation of Silos problem with nonhomogeneous materials, Journal of Geotechnical and Geoenvironmental Engineering, ASCE, 135:1754-1761. Cheng Y. M., Zhao Z. H. and Sun Y. J. (2010), Evaluation of interslice force function and discussion on convergence in slope stability analysis by the lower bound method, Journal of Geotechnical and Geoenvironmental Engineering, ASCE, 136(8):1103-1113. Cheng Y. M., Chau K. T., Xiao L. J. and Li N. (2010a), Flow pattern for silo with two layers of materials with single and double openings, Journal of Geotechnical and Geoenvironmental Engineering, ASCE, 136(9):1278:1286. Cheng Y. M., Li L., Fang S. S. (2011a), Improved harmony search methods to replace variational principle in geotechnical problems, Journal of Mechanics, 27(1):107-119. Cheng Y. M, Li D. Z., Li L., Sun Y. J., Baker R., Yang Y. (2011b), Limit equilibrium method based on approximate lower bound method with variable factor of safety that can consider residual strength. Computers and Geotechnics, 38, 628-637. Cheng Y. M., Li L., Sun Y. J. and Au S. K. (2012), A coupled particle swarm and harmony search optimization algorithm for difficult geotechnical problems. Structural and Multidisciplinary Optimization, 45:489-501. Cheng Y. M., Lansivaara T., Baker R. and Li N. (2013a) The use of internal and external variables and extremum principle in limit equilibrium formulations with application to bearing capacity and slope stability problems, Soils and Foundation, 53(1):130-143. Cheng Y. M., Au S. K., Lai X. L.(2013b), An innovative Geonail System for soft ground stabilization, Soils and foundation, 53(2):282-298. Cheng Y. M., Li D. Z., Lee Y. Y. and Au S. K. (2013c), Solution of some engineering partial differential equations governed by the minimal of a functional by global optimization method, Journal of Mechanics, 1-10. Cheng Y. M. and Lau C. K. (2014), Soil Slope stability analysis and stabilization – new methods and insights, 2nd edition, Spon Press. Cheng Y. M. Li N. and Yang X. Q. (2015a), Three Dimensional Slope Stability Problem with a Surcharge Load, Natural Hazards and Earth System Sciences, 15(10), 2227-2240. Cheng Y. M., Li L. and Liu L. L. (2015b), Simplified Approach for Locating the Critical Probabilistic Slip Surface in Limit Equilibrium Analysis, Natural Hazards and Earth System Sciences, vol.15, 2241-2256. Cheng Y. M. and Li N. (2017), Equivalence between Bearing Capacity, Lateral Earth Pressure and Slope Stability Problems by Slip-line and Extremum Limit Equilibrium Methods, International Journal of Geomechanics, ASCE (accepted for publication). Ching J., Phoon K. K. and Hu Y. G. (2009), Efficient evaluation of reliability for slopes with circular slip surfaces using importance sampling, Journal of Geotechnical and Geoenvironmental Engineering, ASCE, 135(6):768–777. Cho S. E. (2007), Effects of spatial variability of soil properties on slope stability. Eng Geol., 92(3-4):97-109. Cho S. E. (2009), Probabilistic stability analyses of slopes using the ANN-based response surface, Computers and Geotechnics, 36:787-797. Cho S. E. (2010), Probabilistic assessment of slope stability that considers the spatial variability of soil properties. J Geotech Geoenviron Eng, ASCE, 136(7):10. Chowdhury R.N. (1987), Slope Analysis, New York: Elsevier. Chowdhury R. N. and Xu D. W. (1995), Geotechnical system reliability of slopes, Reliability Engineering and System Safety, vol.47, 141-151. Christian J. T., Ladd C. and Baecher G. B. (1994), Reliability applied to slope stability analysis, Journal of Geotechnical Engineering, 120(12): 2180-2207. Christiansen E. (1996), Limit analysis of collapse states, in Ciarllet P.G. and J. L. Lions, (eds. ), Handbook of Numerical Analysis. North-Holland: Gulf Professional Publishing, pp. 193-312. Christiansen E. and Edmund O. S. (2001), Automatic mesh refinement in limit analysis, International Journal for Numerical Methods in Engineering, 50(6), 1331-1346. Chugh A. K. (1986), Variable factor of safety in slope stability analysis. Geotechnique, 36, 57–64. Ciria, H. (2002), Computation of upper and lower bounds in limit analysis using second-order cone programming and mesh adaptivity, Master thesis, Massachusetts Institute of Technology. Ciria H., Peraire J. and Bonet J. (2008), Mesh adaptive computation of upper and lower bounds in limit analysis, International Journal for Numerical Methods in Engineering, 75(8), 899-944. Clarke S. D., Smith C. C. and Gilbert M. (2013), Modelling discrete soil reinforcement in numerical limit analysis, Canadian Geotechnical Journal, vol.50:705-715. Contreras H. (1980), The stochastic finite-element method, Computers and Structures, 12(3): 341-348. Collin A. (1846), Recherches Expérimentales sur les Glissements Spontanés des Terrains Argileux, accompagnées de Considerations sur Quelques Principes de la Méchanique Terrestre. [Experimental Research on the Spontaneous Landslides of the Clay Soils, accompanied by Considerations on Some Principles of the Terrestrial Mechanics.] Carilian-Goeury and Dalmont, Paris. Cornell C. A. (1969), A probability based structural code, J. Amer. Conc. Inst., 66(12): 974-985. Cox A. D. (1962), Axially-symmetric plastic deformation in soils – II, Indentation of ponderable soils, International Journal of Mechanical Sciences, 4, 371–380. Cundall P. A. (1971), A Computer Model for Simulation Progressive Large Scale movement in Blocky System, In Proc. Symp. Int. Soci. Rock Mech., Vol.1, Nancy, France. Cundall P. A. (1974), Rational design of tunnel design – a computer model for rock mass behaviour using interactive graphics for the input and output of geometric data, Technical report MRD-2-74, Missouri River Division, US Army Corps of Engineers. Cundall P. A. and Strack O. D. L. (1979), A discrete numerical model for granular assemblies, Geotechnique, 29(1), 47–65. Cundall P. A. (1988), Formulation of a three-dimensional distinct element model – Part I: A scheme to detect and research contacts in a system composed of many polyhedral blocks, International Journal of Rock Mechanics Min. Sci. and Geomechanics, 25(3): 107-116.
da Silva M. V. and Antao A. N. (2008), Upper bound limit analysis with a parallel mixed finite element formulation, International Journal of Solids and Structures, 45(22–23), 5788-5804. Dasaka S. M. and Zhang L. (2012), Spatial variability of in situ weathered soil, Geotechnique, 49(6):835-840. David F. R. (2001), An Introduction to NURBS: With Historical Perspective, CA, USA: Morgan Kaufmann Publishers. Dawson E. M., Roth W. H. and Drescher A. (1999), Slope stability analysis by strength reduction. Geotechnique, 49(6), 835–840. Dawson E., Motamed F., Nesarajah S. and Roth W. (2000), Geotechnical Stability Analysis by Strength Reduction. Slope Stability 2000, Proceedings of Sessions of Geo-Denver 2000, August 5–8, 2000, Denver, Colorado, pp. 99–113. DeGroot D. J. and Baecher G. B. (1993), Estimating autocovariance of in situ soil properties, Journal of Geotechnical Engineering, 119(1):147-166. De Josseline De Jong G. (1980), Application of calculus of variation to the vertical cut-off in cohesive frictionless soil, Geotechnique, 30(1), 1–16. De Josseline De Jong G. (1981), Variational fallacy, Geotechnique, 31(4), 289–290. De Jong D. J. G. (1957), Graphical method for the determination of slip-line fields in soil mechanics, Ingenior, vol. 69, p.61-65. De Josseline De Jong G. (1980), Application of calculus of variation to the vertical cut-off in cohesive frictionless soil, Geotechnique, 30(1):1–16. De Josseline De Jong G (1981), Variational fallacy, Geotechnique, 31(4):289–290. Der Kiureghian A. and Ke J. B. (1988), The stochastic finite element method in structural reliability, Probabilistic Engineering Mechanics, 3(2): 83-91. Der Kiureghian A. and Dakessian T. (1998), Multiple design points in first and second order reliability, Structural Safety, 20(1): 37-49. Ditlevsen O. (1979), Generalized second moment reliability index, Journal of Structural Mechanics, 7(4):435-451. Dolinski K. (1983), First order second moment approximation in reliability of structural systems –critical review and alternative approach, Structural Safety, 1(3): 211-231. Donald I. and Chen Z. Y. (1997), Slope stability analysis by the upper bound approach: fundamentals and methods, Canadian Geotechnical Journal, 34(6), 853–862. Drucker D. C. and Prager W. (1952), Soil mechanics and plastic analysis or limit design, Quarterly of Applied Mathematics, 10, 157–165. Drucker, D. C., Greenberg, W. and Prager, W. (1951), The safety factor of an elastic plastic body in plane strain, Transactions of the ASME, Journal of Applied Mechanics, 73, 371. Duncan J. M. and Chang C. Y. (1970), Nonlinear analysis of stress and strain in soils, Journal of the soil mechanics and foundations division, ASCE, 96(5):1629-1653. Duncan J. M. (1996), State of the art: Limit equilibrium and finite element analysis of slopes, Journal of Geotechnical Engineering, ASCE, 122(7), 577–596. Duncan, J. M. (2000), Factors of safety and reliability in geotechnical engineering, Journal of Geotechnical and Geoenvironmental Engineering, 126(4): 307–316. Duncan J. M. and Wright S. G. (2005), Soil Strength and Slope Stability, Hoboken, NJ: John Wiley. Eberhardt, Erik (2003), Rock Slope Stability Analysis - Utilization of Advanced Numerical Techniques, Vancouver, Canada: Earth and Ocean Sciences, University of British Columbia. EI-Ramly H., Morgenstern N. R. and Cruden D. M. (2002), Probabilistic slope stability analysis for practice, Canadian Geotechnical Journal, 39(3): 665–683. Espinoza R. D. and Bourdeau P. L. (1994), Unified formulation for analysis of slopes with general slip surface, Journal of Geotechnical Engineering, ASCE, 120(7), 1185–1204. Fellin W., Lessmann H., Oberguggenberger M., Vieider R. (2005), Analyzing Uncertainty in Civil Engineering, Springer. Fan K., Fredlund D. G. and Wilson G. W. (1986), An interslice force function for limit equilibrium slope stability analysis, Canadian Geotechnical Journal, 23(3), 287–296. Farzaneh O. and Askari F. (2003), Three-dimensional analysis of nonhomogeneous slopes, Journal of Geotechnical and Geoenvironmental Engineering, ASCE, 129(2), 137–145. Fellenius W. (1918), Kaj-och jordrasen i Goteborg [Kaj- and jordrasen in Goteborg], Teknisk Tidskrift V.U., 48, 17–19. Fellenius W. (1927), Erdstatische Berechnungen mit Reibung und Kohasion [Earth-static calculations with friction and cohesion] (in German), Berlin: Ernst. Fellenius W. (1936), “Calculation of the stability of earth dams, Transactions of the 2nd Congress on Large Dams”, International Commission on Large Dams of the World Power Conference, 4, 445–462. Fenton G. A. (1999), Random field modeling of CPT data, Journal of Geotechnical Engineering, 125(6):486-498. Fenton G. A. and Vanmarcke E. H. (1998), Spatial variation in liquefaction risk, Geotechnique, 48(6): 819-831. Fenton G. A. and Griffiths D. V. (2002), Probabilistic foundation settlement on spatially random soil, Journal of Geotechnical and Geoenvironmental Engineering, 128(5): 381-390. Fenton G. A. and Griffiths D. V. (2003), Bearing-capacity prediction of spatially random c-phi soils, Canadian Geotechnical Journal, 40(1): 54-65. Fenton G. A. and Griffiths D. V. (2005), Three-dimensional probabilistic foundation settlement, Journal of Geotechnical and Geoenvironmental Engineering, 131(2): 232-239. Fiessler B., Neumann H. J. and Rackwitz R. (1979), Quadratic limit states in structural reliability, Journal of Engineering Mechanics, ASCE, 105(4): 661-676. Fredlund D. G. and Krahn J. (1984), “Analytical methods for slope analysis”, International Symposium on Landslides, pp. 229–250. Fredlund D. G., Zhang Z. M. and Lam L. (1992), Effect of axis on moment equilibrium in slope stability analysis, Canadian Geotechnical Journal, 29(3), 456–465. Frohlich O. K. (1953), The Factor of Safety with Respect to Sliding of a Mass of Soil Along the Arc of a Logarithmic Spiral, Proceedings of the 3rd International Conference on Soil Mechanics and Foundation Engineering, Switzerland, Vol. 2, pp. 230–233. Geotechnical Engineering Office (1976), Report on the Slope Failures at Sau Mau Ping, August, Hong Kong Government. Geotechnical Control Office (1984), Geotechnical Manual for Slopes (Second edition), HKSAR Government. Geotechnical Engineering Office (1994), Report on the Kwun Lung Lau Landslide of 23 July 1994, the HKSAR Government. Geotechnical Engineering Office (1995), Guide to Slope Maintenance (Geoguide 5), CEDD, HKSAR Government. Geotechnical Engineering Office (1996a), Report on the Fei Tsui Road Landslide of 13 August 1995, the HKSAR Government. Geotechnical Engineering Office (1996b), Report on the Shum Wan Road Landslide of 13 August 1995, the HKSAR Government. Geotechnical Engineering Office (1996c), GEO Report No. 52: Investigation of Some Major Slope Failures between 1992 and 1995, the HKSAR Government. Geotechnical Engineering Office (1998), GEO Report No. 78: Report on the Ching Cheung Road Landslide of 3 August 1997, the HKSAR Government. Geotechnical Engineering Office (2001), GEO Report No. 115, Regional Variation in Extreme Rainfall Values. Geotechnical Engineering Office (2003), Technical Guidance Note No. 11: Enhancing the Reliability and Resolution of Engineered Soil Cut Slope. Geotechnical Engineering Office (2004a), GEO Technical Guidance Note No. 15 – Guidelines for Classification of Consequence-to-life Category for Slope Features. Geotechnical Engineering Office (2004b), GEO Technical Note TB1/2004 – Review of Cases with Problems Encountered During Soil Nail Construction (1993-2003). Geotechnical Engineering Office (2007), GEO Publication No. 1/2007 – Engineering Geological Practice in Hong Kong, the HKSAR Government. Geotechnical Engineering Office (2008), Guide to Soil Nail Design and Construction (Geoguide 7), HKSAR Government. Geotechnical Engineering Office (2002), GEO Report No. 56, Application of Prescriptive Measures to Slopes And Retaining Walls (2nd Edition). Geotechnical Engineering Office and Hong Kong Institution of Engineers (2011a), Design of Soil Nails for Upgrading Loose Fill Slopes. Geotechnical Engineering Office (2011b), Technical Guidelines on Landscape Treatment for Slopes - GEO Publication No. 1/2011. Ghanem R., Saad G. and Doostan A. (2007), Efficient solution of stochastic systems: application to the embankment dam problem, Structural Safety, 29(3), 238-251. Gharti H. N., Komatitsch D., Oye V., Martin R. and Tromp J. (2012), Application of an elastoplastic spectral-element method to 3D slope stability analysis, Int. J. Numer. Meth. Engng. 2012; 91:1–26. Gharti H. N., Komatitsch D., Langer L., Martin R. Oye V., Tromp J., Vaaland U., Yan, Z. Z. (2017), SPECFEM3D_GEOTECH v1.2.0, An open-source, parallel and cross-platform geotechnical engineering application. Giger, M. W., and Krizek, R. J. (1975). Stability analysis of vertical cut with variable corner angle. Soils and Foundations, 15, No.2, 63-71. Gilbert M., Smith C. and Pritchard T. (2010). Masonry arch analysis using discontinuity layout optimisation. Proc. Instn Civ. Engrs – Engng Comput. Mech. 163, No. 3, 155–166. Gingold R. A. and Monaghan J. J. (1977), Smoothed particle hydrodynamics: theory and application on on-spherical stars. Mon. Not. R. Astron.Soc. 81, 375–389. Goh A. T. C. (1999), Genetic algorithm search for critical slip surface in multiple-wedge stability analysis, Canadian Geotechnical Journal, 36(2), 382–391. Graham J. (1984), Slope Instability, John Wiley & Sons. Graham, J., Andrew, M. and Shields, D. H. (1988), Stress Characteristics for Shallow Footing in Cohesionless Slopes, Canadian Geotechnical Journal, vol.25, no.2: 238-249. Gratsch T. and Bathe K. J. (2005), A posteriori error estimation techniques in practical finite element analysis, Computers & Structures, 83(4-5), 235-265. Greco V. R. (1996), Efficient Monte Carlo technique for locating critical slip surface, Journal of Geotechnical Engineering, ASCE, 122, 517–525. Greenwood J. R. (1987), Effective Stress Stability Analysis. Discussion in 9th European Conference on Soil Mechanics and Foundations, Dublin, September 1987, Vol. 3, Post Conference Proceedings, Balkema, 1989, pp. 1082–1108. Griffiths D. V. and Lane P. A. (1999), Slope stability analysis by finite elements, Geotechnique, 49(3), 387–403. Griffiths D. V. and Fenton G. A. (2000), Influence of soil strength spatial variability on the stability of an undrained clay slope by finite element, Slope stability 2000, GSP 101, 184-193. Griffiths D. V. and Fenton G. A. (2001), Bearing capacity of spatially random soil:The undrained clay Prandtl problem revisited, Geotechnique, 51(4): 351-359. Griffiths D. V. and Fenton G. A. (2004), Probabilistic slope stability analysis by Finite element methods, Journal of Geotechnical and Geoenvironmental Engineering, ASCE, 130(5): 507-518. Griffiths D. V. and Fenton G. A. (2007), Probabilistic slope stability analysis by Finite element methods, Journal of Geotechnical and Geoenvironmental Engineering, ASCE, 130(5): 507-518. Griffiths D. V. and Fenton G. A. (2009), Probabilistic Settlement Analysis by Stochastic and Random Finite element methods, Journal of Geotechnical and Geoenvironmental Engineering, ASCE, 135(11): 1629-1637. Haefeli R. (1948), The Stability of Slopes Acted Upon by Parallel Seepage, Proceedings of the Second International Conference on Soil Mechanics and Foundation Engineering, Rotterdam, Vol. 1, pp. 57–62. Haldar A. and Mahadevan S. (2000a), Probability, reliability and statistical methods in engineering design, John Wiley. Haldar A. and Mahadevan S. (2000b), Reliability assessment using stochastic finite Reliability assessment using stochastic finite Reliability assessment using stochastic finite analysis, John Wiley. Hansen J. B. (1970), A revised and extended formula for bearing capacity, Danish Geotechnical Institute, Bulletin 28, Copenhagen. Hasofer A. A. and Lind A. M. (1974), Exact and invariant second moment code format, Journal of engineering mechanics division ASCE, 100(1):111–21. Harr M. E. (1977), Mechanics of particulate media: A probabilistic approach, McGraw Hill, New York. Hassan A. M. and Wolff T. F. (1999), Search algorithm for minimum reliability index of earth slopes, Journal of Geotechnical and Geoenvironmental Engineering, ASCE, 125(4): 301-308. Hicks M. A., Chen J. and Spencer W. A. (2008), Influence of spatial variability on 3D slope failures, In Sixth International Conference on Computer Simulation Risk Analysis and Hazard Mitigation. Hicks M. A. and Spencer W. (2010), Influence of heterogeneity on the reliability and failure of a long 3D slopes, Computers and Geotechnics, 37(7-8): 948-955. Hohenbichler M. and Rackwitz R. (1988), First order concept in system reliability, Structural Safety, 1(3): 177-188. Hong H. P. (1999), Simple approximations for improving second-order reliability estimates, Journal of Engineering Mechanics, 125(5): 592-595. Hong, H. P. and Roh G. (2008), Reliability evaluation of earth slopes, Journal of Geotechnical and Geoenvironmental Engineering, ASCE, 134(12): 1700–1705. Honjo Y. and Kuroda K.A. (1991). New look at fluctuating geotechnical data for reliability design, Soils and Foundations, 31(01):110–20. Hovland H. J. (1977), Three-dimensional slope stability analysis method, Journal of the Geotechnical Engineering Division, ASCE, 103(GT9), 971–986. Hsu S. C. and Nelson P. P. (2006), Material spatial variability and slope stability for weak rock masses. J Geotech Geoenviron Eng (ASCE), 132(2):183-93. Huang C. C. and Tsai C. C. (2000), New method for 3D and asymmetrical slope stability analysis, Journal of Geotechnical and Geoenvironmental Engineering, ASCE, 126(10), 917–927. Huang C. C., Tsai C. C. and Chen Y. H. (2002), Generalized method for three- dimensional slope stability analysis, Journal of Geotechnical and Geoenvironmental Engineering, ASCE, 128(10), 836–848. Huang J. S., Griffiths D. V. and Fenton G. A. (2010a), Probabilistic analysis of coupled soil consolidation, Journal of Geotechnical and Geoenvironmental Engineering, ASCE, 136(3): 417-430. Huang J. S., Griffiths D. V. and Fenton G. A. (2010b), System reliability of slopes by RFEM, Soils and Foundations, 50(3): 345-355. Huh, H., and Yang, W. H. (1991), A general algorithm for limit solutions of plane-stress problems, International Journal of Solids and Structures, 28(6), 727-738. Hungr O. (1987), An extension of Bishop’s simplified method of slope stability analysis to three dimensions, Geotechnique, 37(1), 113–117. Hungr O., Salgado F.M. and Byrne P.M. (1989), Evaluation of a three-dimensional method of slope stability analysis, Canadian Geotechnical Journal, 26(4), 679–686. Itasca (1999), PFC2D/3D – Particle Flow Code in 2 Dimensions, Itasca Consulting Group Inc., Minneapolis. Izbicki R. J. (1981), Limit plasticity approach to slope stability problems, Journal of the Geotechnical Engineering Division, Proceedings of the American Society of Civil Engineers, 107, 228–233. Jaksa M. B., Kaggwa W. S. and Brooker P. I. (1999), Experimental evaluation of the scale of fluctuation of a stiff clay, Proc. 8th Int. Conf. on the Application of Statistics and Probability 1, 415-422. Jaksa M. B. and Fenton G. A. (2000), Random field modeling of CPT data, Journal of Geotechnical and Geoenvironmental Engineering 126 (12), 1212-1216. Janbu, N. (1957), Earth pressure and bearing capacity by generalized procedure of slices, Proc. 4th International Conference on Soil Mechanics: 207-212. Janbu N. (1973), Slope stability computations, in: R. C. Hirschfield and S. J. Poulos (eds. ), Embankment-Dam Engineering, pp. 47–86, John Wiley. Janbu N., Bjerrum L. and Kjaernsli B. (1956), Soil Mechanics Applied to Some Engineering Problems, Norwegian Geotechnical Institute, Publ. No. 16. Jha S. K. and Ching J. Y. (2013), Simplified reliability method for spatially variable undrained engineered slopes. Soils and Foundations, 53(5):708-19. Ji J., Liao H. J., Low B. K. (2012), Modeling 2-D spatial variation in slope reliability analysis using interpolated autocorrelations. Comput Geotech., 40:135-46. Jiang J. C. and Yamagami T. (1999), Determination of the Sliding Direction in Three-Dimensional Slope Stability Analysis, Proceedings of 44th Symposium on Geotechnical Engineering, pp. 193–200. Jiang S. H., Li D. Q., Zhang L. M. and Zhou C. B. (2014), Slope reliability analysis considering spatially variable shear strength parameters using a non-intrusive stochastic finite element method, Engineering Geology, 168:120-8. Jiang S. H., Li D. Q., Cao Z. J., Zhou C. B., Phoon K. K. (2014), Efficient System Reliability Analysis of Slope Stability in Spatially Variable Soils Using Monte Carlo Simulation. J Geotech Geoenviron Eng, ASCE, 141(2). Jian Ji (2013), Reliability analysis of earth slopes accounting for spatial variation, PhD thesis, Nanyang Technological University. Numerical limit analysis: A decomposition approach, International Journal for Numerical and Analytical Methods in Geomechanics, 34(18), 1960-1980. Kang F., Han S. X., Salgado R. and Li J. J. (2015), System probabilistic stability analysis of soil slopes using Gaussian process regression with Latin hypercube sampling, Computers and Geotechnics, 63:13:25. Karel K. (1977a), Application of energy method, Journal of the Geotechnical Engineering Division, Proceedings of the American Society of Civil Engineers, 103, 381–397. Karel K. (1977b), Energy method for soil stability analyses, Journal of the Geotechnical Engineering Division, Proceedings of the American Society of Civil Engineers, 103, 431–445. Kawai T. (1977), New discrete structural models and generalization of the method of limit analysis, in: P.G. Bergan et al. (eds. ), Finite Elements in Nonlinear Mechanics, pp. 885–906, Trondheim: NIT. Kelly, D. W., Gago, J. P. D. R., Zienkiewicz, O. C., and Babuska, I. (1983), A-posteriori error analysis and adaptive processes in the finite-element method. 1. error analysis, International Journal for Numerical Methods in Engineering, 19(11), 1593-1619. Kerisel J. and Absi E. (1990), Active and Passive Earth Pressure tables, A. A. Ba1kema. Khatri, V. N., and Kumar, J. (2009), Bearing capacity factor N-c under phi=0 condition for piles in clays, International Journal for Numerical and Analytical Methods in Geomechanics, 33(9), 1203-1225. Kim J., Salgado R. and Yu H. S. (1999), Limit analysis of soil slopes subjected to pore-water pressures, Journal of Geotechnical Engineering, ASCE, 125(1), 49– 58. Kim, J., Salgado, R., and Lee, J. (2002), Stability analysis of complex soil slopes using limit analysis, Journal of Geotechnical and Geoenvironmental Engineering, 128(7), 546-557. Kim J. M. and Sitar N. (2013), Reliability approach to slope stability analysis with spatially correlated soil properties. Soils and Foundations, 53(1):1-10. King G. J. W. (1989), Revision of effective stress method of slices, Geotechnique, 39(3), 497–502. Kossaczky I. (1994), A recursive approach to local mesh refinement in 2 and 3 dimensions, Journal of Computational and Applied Mathematics, 55(3), 275-288. Kotter F. (1903), Die Bestimmug des Druckes an gekrummten Gleitflachen, eine Aufgabe aus der Lehr vom Erddruck, Berlin. Koyluoglu H. U. and Nielsen S. R. K. (1994), New approximations for SORM integrals, Structural Safety, 13(4): 235-246. Krabbenhoft K., Lyamin A. V., Hjiaj M. and Sloan S. W. (2005), A new discontinuous upper bound limit analysis formulation, International Journal for Numerical Methods in Engineering, 63(7), 1069-1088. Krabbenhoft K., Lyamin A. V., and Sloan S. W. (2008), Three-dimensional Mohr-Coulomb limit analysis using semidefinite programming, Communications in Numerical Method in Engineering, 24(11), 1107-1119. Kulhawy F. H. and Mayne P. W. (1990), Manual on estimating soil properties for foundation design, Cornell Univ., Ithaca, NY (USA). Kumar, J., and Khatri, V. N. (2011), Bearing capacity factors of circular foundations for a general c-phi soil using lower bound finite elements limit analysis, International Journal for Numerical and Analytical Methods in Geomechanics, 35(3), 393-405. Kusakabe O., Kimura T. and Yamaguchi U. (1981), Bearing capacity of slopes under strip loads on the top surfaces, Soils and Foundations, 21(4): 29-40. Lacasse S. and Nadim F. (1998), Risk and Reliability in Geotechnical Engineering, 4th International Conference on Case Histories in Geotechnical Engineering, 1172-1192. Lam L. and Fredlund D. G. (1993), A general limit equilibrium model for three-dimensional slope stability analysis, Canadian Geotechnical Journal, 30(6), 905–919. Lam L. and Fredlund D. G. (1994), A general limit equilibrium model for three- dimensional slope stability analysis: Reply, Canadian Geotechnical Journal, 31(5), 795–796. Law K. T. and Lumb P. (1978), A limit equilibrium analysis of progressive failure in the stability of slopes. Canadian Geotechnical Journal, 15(1), 113–122. Le, C. V., Askes, H., and Gilbert, M. (2010a), Adaptive element-free Galerkin method applied to the limit analysis of plates, Computer Methods in Applied Mechanics and Engineering, 199(37-40), 2487-2496. Le, C. V., Gilbert, M., and Askes, H. (2010b), Limit analysis of plates and slabs using a meshless equilibrium formulation, International Journal for Numerical Methods in Engineering, 83(13), 1739-1758. Les P. and Wayne T. (1997), The NURBS Book, 2nd edition, Springer Verlag. Leshchinsky D. and Huang C. C. (1992), Generalized three-dimensional slope stability analysis, Journal of Geotechnical Engineering, ASCE, 118, 1559–1576. Leshchinsky D., Baker R. and Silver M. L. (1985), Three-dimensional analysis of slope stability, International Journal for Numerical and Analytical Methods in Geomechanics, 9(3), 199–223. Leshchinsky D. and Volk J. C. (1985), Stability Charts for Geotextile-Reinforced Walls, Transportation Research Record 1031, Transportation Research Board, National Research Council, National Academy Press, Washington, DC, pp. 5–16. Leshchinsky D. and Baker R., (1986). Three dimensional slope stability - End effects. Soils and Foundations, Vol. 26, No. 4, pp. 98-110. Leshchinsky D. and San K. (1994), Pseudostatic seismic stability of slopes: Design charts, Journal of Geotechnical Engineering, 120(9) 1514–1532. Leshchinsky B. (2015), Bearing Capacity of Footings Placed Adjacent to c'-ϕ' Slopes, Journal of Geotechnical and Geoenvironmental Engineering, ASCE, 141(6), 04015022. Leshchinsky B. and Ambauen S. (2015), Limit Equilibrium and Limit Analysis: Comparison of Benchmark Slope Stability Problems, Journal of Geotechnical and Geoenvironmental Engineering, ASCE, 141(10), 04015043. Li D. Z. (2014), Lower and upper bound limit analyses for stability problems in geotechnical engineering, PhD Thesis, Hong Kong Polytechnic University. Li L., Chi S.C. and Lin G. (2005), The genetic algorithm incorporating harmony procedure and its application to the search for the non-circular critical slip sur- face for soil slopes, Journal of Hydraulic Engineering, 36, 913–918 (in Chinese). Li N. and Cheng Y. M. (2015), Laboratory and 3D-Distinct Element Analysis of Failure Mechanism of Slope under External Surcharge. Natural Hazards and Earth System Sciences, 15, 35-43, 2015. Li N. and Cheng Y. M. (2016), Discrete Element Modeling on Bearing Capacity Problems, International Journal of Environmental, Chemical, Ecological, Geological and Geophysical Engineering, Vol:10, No:6, 495-502. Li H. X., and Yu H. S. (2005), Kinematic limit analysis of frictional materials using nonlinear programming, International Journal of Solids and Structures, 42(14), 4058-4076. Li K. S. (1992), Some common mistakes in probabilistic analysis of slopes, Proceedings of 6th International Symposium on landslides, Christchurch, New Zealand, 475-480. Li K. S. and Lumb P. (1987), Probabilistic design of slopes, Canadian Geotechnical Journal, 24(4), 520-535. Li D. Q., Jiang S. H., Cao Z. J., Zhou W., Zhou C. B. and Zhang L. M. (2015), A multiple response-surface method for slope reliability analysis considering spatial variability of soil properties. Engineering Geology, 187:60-72. Li D. Q., Xiao T., Cao Z. J., Zhou C. B. and Zhang L. M. (2015), Enhancement of random finite element method in reliability analysis and risk assessment of soil slopes using Subset Simulation, Landslides, 293-303. Lind N. C. (1983), Modelling uncertainty in discrete dynamical systems, Applied mathematical modelling, 7(3), 146-152. Liu F. Q., Wang J. H. & Zhang L. L. (2009a), Axi-symmetric active earth pressure obtained by the slip line method with a general tangential stress coefficient, Computers and Geotechnics, 36, No. 1–2, 352–358. Liu, F. Q., Wang, J. H. & Zhang, L. L. (2009b). Analytical solution of general axisymmetric active earth pressure. International Journal for Numerical and Analytical Methods in Geomechanics, 33, No. 4, 551–565. Liu F. Q. (2014), Lateral earth pressures acting on circular retaining walls, International Journal of Geomechanics, 14, No. 3, 04014002. Liu G. R. and Liu M. B. (2003), Smoothed Particle Hydrodynamics: A Meshfree Particle Method, World Scientific, 449p. Liu L. L. and Cheng Y. M. (2016), Efficient system reliability analysis of soil slopes using multivariate adaptive regression splines-based Monte Carlo simulation, Computers and Geotechnics, vol.79, 41-54. Liu L. L., Cheng Y. M. and Wang X. M. (2017a), Genetic algorithm optimized Taylor Kriging surrogate model for system reliability analysis of soil slopes, Journal of Landslides, 14:535-546. Liu L. L. and Cheng Y. M. (2017b), Conditional random field reliability analysis of a cohesion-frictional slope, Computers and Geotechnics, vol.82, 173-186. Liu L. L., Cheng Y. M., Jiang S. H., Shang S. H., Wang X. M. (2017b), Effects of spatial autocorrelation structure of permeability on seepage through an embankment on soil foundation, Computers and Geotechnics, 87, 62-75. Liu L. L., Cheng Y. M., Wang X. M., Zhang S. H. and Wu Z. H. (2017d), System reliability analysis and risk assessment of a layered slope in spatially variable soils considering stratigraphic boundary uncertainty, Computers and Geotechnics, 89:213-225. Liu S. Y., Shao L. T. and Li H. J. (2015), Slope stability analysis using the limit equilibrium method and two finite element methods. Computers and Geotechnics 63, 291-298. Low B. K. (2003), Practical probabilistic slope stability analysis. In: Proceedings of the soil and rock America, 12th Panamerican conference on soil mechanics and geotechnical engineering and 39th US rock mechanics symposium. Massachusetts: MIT, Cambridge. Low B. K. (2014) FORM, SORM, and spatial modeling in geotechnical engineering. Structural Safety, 49:56-64. Low B. K. and Tang W. H. (1997a). "Reliability analysis of reinforced embankments on soft ground, Canadian Geotechnical Journal, vol.34, 672-685. Low B. K. and Tang W. H. (1997b), Probabilistic slope analysis using Janbu's generalized procedure of slices, Computers and Geotechnics, 21(2):121-142. Low B. K., Gilbert R. B. and Wright S. G. (1998), Slope reliability analysis using generalized method of slices, Journal of Geotechnical and Geoenvironmental Engineering, 124(4), 350–362. Low B. K., Lacasse S. and Nadim F. (2007), Slope reliability analysis accounting for Low spatial variation, Georisk, 1(4):177-189. Lowe J. and Karafiath L. (1960), Stability of Earth Dams Upon Drawdown, Proceedings of the 1st Pan-American Conference on Soil Mechanics and Foundation Engineering, Mexico City, Vol. 2, pp. 537–552. Lucy, L. B. (1977), A numerical approach to the testing of the fission hypothesis. Astron. J. 82, 1023–1024. Lumb P. (1970), Safety factors and the probability distribution of soil strength, Canadian Geotechnical Journal, 7(3): 225-242. Lumb P. (1974), Application of statistics in soil mechanics, Soil mechanics: New horizons, 44-111. Lyamin A. V. (1999), Three-dimensional lower bound limit analysis using nonlinear programming, PhD thesis, Department of Civil, Surveying and Environmental Engineering, University of Newcastle, Australia. Lyamin A. V. and Sloan S. W. (1997), A comparison of linear and nonlinear programming formulations for lower bound limit analysis, in: S. Pietruszczak and G. N. Pande (eds. ), Proceedings of the 6th International Symposium on Numerical Models in Geomechanics, pp. 367–373, Balkema, Rotterdam. Lyamin A. V. and Sloan S. W. (2002a), Lower bound limit analysis using nonlinear programming, International Journal for Numerical Methods in Engineering, 55(5), 573–611. Lyamin A. V. and Sloan S. W. (2002b), Upper bound limit analysis using linear finite elements and non-linear programming, International Journal for Numerical and Analytical Methods in Geomechanics, 26(2), 181–216. Lyamin A. V. and Sloan S. W. (2003), Mesh generation for lower bound limit analysis, Advances in Engineering Software, 34, 321-338. Lyamin A. V., Sloan S. W., Krabbenhoft K. and Hjiaj, M. (2005), Lower bound limit analysis with adaptive remeshing, International Journal for Numerical Methods in Engineering, 63(14), 1961-1974. Lysmer J. (1970), Limit analysis of plane problems in soil mechanics, Journal of the Soil Mechanics and Foundations Division, Proceedings of the American Society of Civil Engineering, 96, 1311–1334. Makrodimopoulos, A., and Martin, C. M. (2006), Lower bound limit analysis of cohesive-frictional materials using second-order cone programming, International Journal for Numerical Methods in Engineering, 66(4), 604-634. Makrodimopoulos, A., and Martin, C. M. (2007), Upper bound limit analysis using simplex strain elements and second-order cone programming, International Journal for Numerical and Analytical Methods in Geomechanics, 31(6), 835-865. Makrodimopoulos, A., and Martin, C. M. (2008), Upper bound limit analysis using discontinuous quadratic displacement fields, Communications in Numerical Methods in Engineering, 24(11), 911-927. Malkawi A. I. H., Hassan W. F. and Abdulla F. A. (2000), Uncertainty and reliability analysis applied to slope stability, Structural Safety, 22,161–187. Malkawi A. I. H, Hassan W. F. and Sarma S. K. (2001), Global search method for locating general slip surface using Monte Carlo techniques, Journal of Geotechnical and Geoenvironmental Engineering, 127, 688–698. Manna B., Rawat S., Zodinpuii R. Sharma K. G. (2014), Effect of Surcharge Load on Stability of Slopes - Testing and Analysis, EJGE, vol.19, 3397-3410. Martin C. M. (2004), User Guide for ABC – Analysis of Bearing Capacity (v1.0), Department of Engineering Science, University of Oxford. Martin C. M. (2005), Exact bearing capacity calculations using the method of characteristics, Proc. 11th Int. Conf. IACMAG, Turin, vol. 4: 441-450. Martin C. M. and Makrodimopoulos A. (2008), Finite-element limit analysis of Mohr-Coulomb materials in 3D using semidefinite programming, Journal of Engineering Mechanics-ASCE, 134(4), 339-347. Matsui T. and San K. C. (1992), Finite element slope stability analysis by shear strength reduction technique, Soils and Foundations, 32(1), 59–70. Matsuo, M. and Kuroda, K. (1974), Probabilistic approach to design of embankments, Soils and Foundations, 14(2): 1-17. Mencl V. (1966), Mechanics of landslides with non-circular slip surfaces with special reference to the Vaiont slide, Geotechnique, 16(4), 329–337. Merifield, R. S., Lyamin, A. V., and Sloan, S. W. (2006), Limit analysis solutions for the bearing capacity of rock masses using the generalised Hoek-Brown criterion, International Journal of Rock Mechanics and Mining Sciences, 43(6), 920-937. Meyerhof G. G. (1963), Some recent research on the bearing capacity of foundations, Canadian Geotechnical Journal, 1: 16-26. Michalowski R. L. (1989), Three-dimensional analysis of locally loaded slopes, Geotechnique, 39(1), 27–38. Michalowski R. L. (1995), Slope stability analysis: A kinematical approach, Geotechnique, 45(2), 283–293. Michalowski R. L. (1997): An estimate of the influence of soil weight on bearing capacity using limit analysis, Soils and Foundations, 37 (4) 57-64. Michalowski R.L. (2001), Upper-bound load estimates on square and rectangular footings. Géotechnique, 51(9): 787–798. Milani, G. (2008), 3D upper bound limit analysis of multi-leaf masonry walls, International Journal of Mechanical Sciences, 50(4), 817-836. Milani, G. (2011), Kinematic FE limit analysis homogenization model for masonry walls reinforced with continuous FRP grids, International Journal of Solids and Structures, 48(2), 326-345. Milani, G., Lourenco, P., and Tralli, A. (2007), 3D homogenized limit analysis of masonry buildings under horizontal loads, Engineering Structures, 29(11), 3134-3148. Milani, G., Milani, E., and Tralli, A. (2010), Approximate limit analysis of full scale FRP-reinforced masonry buildings through a 3D homogenized FE package, Composite Structures, 92(4), 918-935. Monaghan J. J. (2000), SPH without a tensile instability, J. Comput. Phys., 159:290–311. Morgenstern N. R. (1992), The Evaluation of Slope Stability – A 25-Year Perspective, Stability and Performance of Slopes and Embankments – II, Geotechnical Special Publication No. 31, ASCE. Morgenstern N. R. and Price V. E. (1965), The analysis of stability of general slip surface, Geotechnique, 15(1), 79–93. Moriguchi S. (2005), CIP-based Numerical Analysis for Large Deformation of Geomaterials, Ph.D. Dissertation, Gifu University, Japan, 123. Moriguchi S., Yashima A., Sawada K., Uzuoka R. and Ito, M. (2005), Numerical simulation of flow failure of geomaterials sassed on fluid dynamics. Soils Found. 45(2),155–165. Munoz J. J., Bonet J., Huerta A. and Peraire J. (2009), Upper and lower bounds in limit analysis: Adaptive meshing strategies and discontinuous loading, International Journal for Numerical Methods in Engineering, 77(4), 471-501. Nash D. (1987), A comparative review of limit equilibrium methods of stability analysis, in: M.G. Anderson and K.S. Richards (eds. ), Slope Stability, pp. 11–75, New York: John Wiley & Sons. Nguyen V. U. and Chowdhury R. N. (1984), Probabilistic study of spoil pile stability in strip coal mines – two techniques compared, International of Rock Mechanics and Mining, 21(6): 303-312. Nonoyama H., Moriguchi S., Sawada K. and Yashima A. (2015), Slope stability analysis using smoothed particle hydrodynamics (SPH) method, Soils and Foundations, 55(2):458–470. Nonoyama H. Yashima A. and Moriguchi S. (2013), Future evolution of slope stability analysis created by SPH method, Proceedings of the 18th International Conference on Soil Mechanics and Geotechnical Engineering, Paris, 2229-2232. Nguyen V. U. (1985), Determination of critical slope failure surfaces, Journal of Geotechnical Engineering, ASCE, 111(2), 238–250. Oka Y. and Wu T. H. (1990), System reliability of slope stability, Journal of Geotechnical Engineering, ASCE Geotechnical Engineering, 116(8), 1185-1189. Ono Y. (2012), SPH Simulation of Earthquake-induced Slope Failure, 15th World Conference on Earthquake Engineering 2012, Lisbon, Portugal, 22185-22193. Paice G. M., Griffiths D. V. and Fenton A. (1996), Finite element modeling of settlements on spatially random soil, Journal of geotechnical engineering, ASCE, 122(9): 777-779. Pan Jiazheng (1980), Analysis of Stability and Landslide for Structures, Hydraulic Press, Beijing, pp. 25–28 (in Chinese). Pastor, J., and Turgeman, S. (1982). Limit analysis in axisymmetrical problems: numerical determination of complete statical solutions, International Journal of Mechanical Sciences, 24(2), 95-117. Pastor J., Loute E. and Thai T. H. (2002), Limit analysis and new methods of optimization, Proceedings of the 5th European Conference on Numerical Methods in Engineering. City: Paris, pp. 211–219. Patera A. T. (1984), A spectral element method for fluid dynamics: laminar flow in a channel expansion. Journal of Computational Physics, 54:468–488. Peng M. X. & Chen J. (2013), Slip-line solution to active earth pressure on retaining walls, Geotechnique, 63, No. 12, 1008–1019. Peterson P. and Kwong H. (1981), A design rain storm profile for Hong Kong, Royal Observatory, HKSAR, Technical Note no. 58. Petterson K. E. (1955), The early history of circular sliding surfaces, Geotechnique, 5, 275–296. Pham H. T. V. and Fredlund D. G. (2003), The application of dynamic programming to slope stability analysis, Canadian Geotechnical Journal, 40(4), 830–847. Phoon K. and Kulhawy F. H. (1999a), Characterization of geotechnical variability, Canadian Geotechnical Journal, 36(4):612-624. Phoon K. and Kulhawy F. H. (1999b), Evaluation of geotechnical property variability, Canadian Geotechnical Journal, 36(4):625-639. Phoon K. K. and Ching J. (2015), Risk and reliability in geotechnical engineering, CRC Press. Plaxis (2014), Plaxis user guide. Polidori D. C., Beck J. L. and Papadimitriou C. (1999), New approximations for reliability integrals, Journal of Engineering Mechanics, 125(4): 466-475. Prandtl, L., (1920). Über die Härte plastischer Köroer [About the hardness of plastic bodies], Nachr. Kgl. Ges. Wiss. Göttingen, Math. Phys. KL: 74–85. Pun W. K. and Yeo K. C. (1995), Report on the Investigation of the 23 July and 7 August 1994 Landslides at Milestone 14½ Castle Peak Road, GEO Report No. 52, Geotechnical Engineering Office, Hong Kong, pp. 83–97. Rackwitz R. (2001), Reliability analysis: A review and some perspectives, Structural safety, 23(4): 365-395. Rassam D. W. and Williams D. J. (1999), 3-dimensinal effects on slope stability of high waste rock dumps. International Journal of Surface Mining, 13:19-24. Reissner H. (1924), Zum Erddruckproblem,” Proc., 1st Int. Congress for Applied Mechanics, C. B. Biezeno and J. M. Burgers, eds., Delft, The Netherlands, 295–311. Revilla J. and Castillo E. (1977), The calculus of variations applied to stability of slopes, Geotechnique, 27, 1–11. Rivara M. C. (1984), Mesh refinement processes based on the generalized bisection of simplices, SIAM Journal on Numerical Analysis, 21(3), 604-613. Rivara M. C. (1989), Selective refinement algorithms for sequences of nested triangulations, International Journal for Numerical Methods in Engineering, 28(12), 2889-2906. Rivara M. C., and Iribarren G. (1996), The 4-triangles longest-side partition of triangles and linear refinement algorithms, Mathematics of Computation, 65(216), 1485-1502. Rocscience 2006, Slide Verification Manual I, Rocscience Inc.
Rosenberg I. G., and Strenger F. (1975), A lower bound on the angles of triangles constructed by bisecting the longest side, Mathemathics of Computation, 29(130), 390-395. Rosenberg I. G., and Esteva L. (1972), Reliability basis for some Mexican codes, Probabilistic design of Reinforced Concrete Building, Detroit, Mich., Aci Publication SP-31, ACI: 1-42. Sarma S. K. (1973), Stability analysis of embankments and slopes, Geotechnique 23(3), 423–433. Sarma S. K. (1979), Stability analysis of embankments and slopes, Journal of the Soil Mechanics and Foundations Division, 105(GT12), 1511–1522. Sarma S. K. (1987), A note on the stability of slopes, Geotechnique, 37(1), 107–111. Sarma S. K. and Tan D. (2006), Determination of critical slip surface in slope analysis, Geotechnique, 56(8), 539–550. Schmidt A. and Siebert G. K. (2000), ALBERT: An adaptive hierarchical finite element toolbox, City: Freiburg, Germany. Schultze E. (1975), Some aspects concerning the application of statistics and probability to foundation structures, Proceedings of the 2nd International Conference on Applications of Statistics and Probability in Soil and Structural Engineering, Aachen, 457-494. Sewell E. G. (1972), Automatic mesh generation of triangulation for piecewise polynomial approximation, PhD thesis, Purdue University, West Lafayette. Shen C. K., Bang S. and Herrman L. R. (1981), Ground movement analysis of earth support system, Journal of Geotechnical Engineering, ASCE, 107(12):1610-1624. Shield R. T. (1955), On the plastic flow of metals under conditions of axial symmetry, Proceedings of the Royal Society of London Series A, 233, 267–287. Shields D. H., Scott J. D., Bauer G. E., Deschenes J. H. and Barsvary A. K. (1977), Bearing capacity of foundations near slopes, Proceedings of the 9th International Conference on Soil Mechanics and Foundations Engineering, Tokyo, vol.2: pp.715-720. Shukla S. K., Gupta S. K. and Sivakugan N. (2009), Active earth pressure on retaining wall for c-φ soil backfill under seismic loading condition, Journal of Geotechnical and Geoenvironmental Engineering ASCE, 135(5): 690–696. Shinozuka M. and Deodatis G. (1988), Response variability of stochastic finite-element systems, Journal of Engineering mechanics, ASCE, 114(3): 499-519. Sloan, S. W., and Booker, J. R. (1986), Removal of singularities in Tresca and Mohr-Coulomb yield functions, Communications in Applied Numerical Methods, 2(2), 173-179. Sloan S. W. (1988a), Lower bound limit analysis using finite elements and linear programming. International Journal for Numerical and Analytical Methods in Geomechanics, 12(1), 61–77. Sloan S. W. (1988b), A steepest edge active set algorithm for solving sparse linear programming problem, International Journal for Numerical Methods in Engineering, 26(12), 2671–2685. Sloan S. W. (1989), Upper bound limit analysis using finite elements and linear programming, International Journal for Numerical and Analytical Methods in Geomechanics, 13(3), 263–282. Sloan S. W. and Kleeman P. W. (1995), Upper bound limit analysis using discontinuous velocity fields, Computer Methods in Applied Mechanics and Engineering, 127(1–4), 293–314. Sloan S. W., Krabbenhoft K. and Lyamin A. V. (2008), Lower bound shakedown analysis in geotechnics, International Association for Computer Methods and Advances in Geomechanics (IACMAG). City: Goa, India, pp. 328-335. Slope 2000, User Guide, 2007, http://www.cee.polyu.edu.hk/~ceymcheng/. Smith, C., and Gilbert, M. (2007), Application of discontinuity layout optimization to plane plasticity problems, Proceedings of the Royal Society A-Mathematical Physical and Engineering Sciences, 463(2086), 2461-2484. Smith C. C. and Gilbert M., (2013), Identification of rotational failure mechanisms in cohesive media using discontinuity layout optimization, Geotechnique, 63(14):1194-1208. Sokolovskii V. V. (1960), Statics of Soil Media (translated by D.H. Jones and A.N. Scholfield), London: Butterworths Scientific. Sokolovskii V. V. (1965), Statics of Granular Media (translated by Lusher J.K. and Daniel A.W.T. ), Pergamon Press. Spanos P. D. and Ghanem R. (1989), Stochastic finite element expansion for random medium, Journal of Engineering Mechanics, ASCE, 115(5): 1035-1053. Spencer E. (1967), A method of analysis of the stability of embankments assuming parallel inter-slice forces, Geotechnique, 17, 11–26. Stark T. D. and Eid H. T. (1998), Performance of three-dimensional slope stability methods in practice, Journal of Geotechnical and Geoenvironmental Engineering, ASCE, 124(11), 1049–1060. Strum, J. F. (1999), SeDuMi 1.02, a Matlab toolbox for optimizing over symmetric cones. Methods & Software, 11-12, 625-663. Stuedlein A., Kramer S., Arduino P. and Holtz R. (2012), Geotechnical characterization and random field modeling of desiccated clay, Journal of Geotechnical and Geoenvironmental Engineering, ASCE, 138(11): 1301-1313. Subra RAO K. S., Choudhury D. (2005), Seismic passive earth pressures in soils, Journal of Geotechnical and Geoenvironmental Engineering, 131(1): 131–135. Sultan H. A. and Seed H. B. (1967), Stability analysis of Sloping core earth dam, J. Soil Mech. Found. Eng., ASCE, 93:45-67. Taylor D. W. (1937), Stability of earth slopes, Journal of the Boston Society of Civil Engineers, 24, 197–246. Terzaghi K. (1943), Theoretical soil mechanics, New York: Willey. Thomaz J. E. and Lovell C. W. (1988), Three-dimensional Slope Stability Analysis with Random Generation of Surfaces, Proceedings of the 5th International Symposium on Landslides, Vol. 1, pp. 777–781. Thornton C (1997). Coefficient of restitution for collinear collisions of elastic perfectly plastic spheres. Journal of Applied Mechanics, 64:383-386. Tiwari, R. C. (2015). Simplified Numerical Implementation in Slope Stability Modeling. International Journal of Geomechanics 15(3), 04014051. Tiwari R. C., Bhandary N. P. and Yatabe R. (2013), Application of Spectral Element Method for Stability Evaluation of Nuta-Yone Landslide in Shikoku, Japan, Int. J. Lsld. Env., 1(1), 107-108. Tiwari R. C., Bhandary N. P. and Yatabe R. (2014), Spectral element analysis to evaluate the stability of long and steep slopes, Acta Geotechnica (2014) 9:753–770. Tiwari R. C., Bhandary N. P. and Yatabe R. (2015), 3-D elasto-plastic spectral element application to evaluate the stability of large-scale landslides, Geomechanics and Geoengineering, Vol. 10, No. 4, 271–289. Tschuchnigg F., Schweiger H. F., Sloan S. W., Lyamin A. V. and Raissakis I. (2015a). Comparison of finite-element limit analysis and strength reduction techniques. Geotechnique 65 (4), 249-257. Tschuchnigg F., Schweiger H. F. and Sloan S. W. (2015b). Slope stability analysis by means of finite element limit analysis and finite element strength reduction techniques. Part I: Numerical studies considering non-associated plasticity. Computers and Geotechnics 70, 169-177. Tvedt L. (1990), Distribution of quadratic forms in normal space: Application to structural reliability, ASCE Journal of Engineering Mechanics, 116(6): 1183-1197. Ugai K. (1985), Three-dimensional stability analysis of vertical cohesive slopes, Soils and Foundations, 25, 41–48. Ugai K. (1988), 3-D Slope Stability Analysis by Slice Methods, Proceedings of the 6th International Conference on Numerical Methods in Geomechanics, Innsbruck, Austria, pp. 1369–1374. U.S. Army Corps of Engineers (1999), Risk based analysis in geotechnical engineering for support of planning studies, Appendix A:A11-A23. Vahedifard F., Leshchinsky B., Sehat S. and Leshchinsky D. (2014), Impact of Cohesion on Seismic Design of Geosynthetic-Reinforced Earth Structures, Journal of Geotechnical and Geoenvironmental Engineering, ASCE, 140(6), 04014016. Vanmarcke E. H. (1977a), Probabilistic modeling of soil profiles, Journal of the Geotechnical Engineering, ASCE, 103(11): 1227-1246. Vanmarcke E. H. (1977a), Reliability of earth slopes, Journal of the Geotechnical Engineering, ASCE, 103(11): 1247-1265. Vanmarcke E. and Grigoriu M. (1983), Stochastic finite element analysis of simple beams, Journal of Engineering Mechanics, ASCE, 109(5): 1203-1214. Vesic A. S. (1973), Analysis of ultimate loads for shallow foundations, Journal of Soil Mechanics and Foundations Division, ACSE, 99(SM1): 45-73. Vo T. and Russell A. R. (2014), Slip line theory applied to a retaining wall–unsaturated soil interaction problem, Computers and Geotechnics, 55, No. 1, 416–428. Vo T. and Russell A. R. (2016), Bearing capacity of strip footings on unsaturated soils by the slip line theory, Computers and Geotechnics, 74, No. 1, 122–131. Wang Y. J. (2001), Stability analysis of slopes and footings considering different dilation angles of geomaterial. Ph.D. thesis, Department of Civil and Structural Engineering, Hong Kong Polytechnic University. Wang Y., Cao Z. J., Au S. K. (2011), Practical reliability analysis of slope stability by advanced Monte Carlo simulations in a spreadsheet. Can Geotech J., 48:162-72. Wei W. B., Cheng Y. M. and Li L. (2009a), Three-dimensional slope failure by strength reduction and limit equilibrium methods, Computers and Geotechnics, 36:70-80. Wei W. B. and Cheng Y. M. (2009b), Soil nailed slope by strength reduction and limit equilibrium methods, Computers and Geotechnics, 37:602-618. Wei W. B. and Cheng Y. M. (2009c), Strength reduction analysis for slope reinforced with one row of piles, Computers and Geotechnics, 36:1176-1185. Wei W. B. and Y. M. Cheng (2010), Stability analysis of slope with water flow by strength reduction method, Soil and Foundations, 50(1), 83-92. Whitman R. V. and Bailey W. A. (1967), Use of computers for slope stability analyses, Journal of the Soil Mechanics and Foundation Division, ASCE, 93(4), 475– 498. Wolff T. F. (1985), Analysis and design of embankment dam slopes: A probabilistic approach, PhD Thesis, Purdue University. Wolff T. F. (1991), Embankment reliability versus factor of safety - Before and after slide repair, International Journal for Numerical and Analytical Methods in Geomechanics, 15(1): 41-50. Wong H. N. and Ho K. K. S. (2005), Landslide risk management and slope engineering in Hong Kong, State-of-the Practice of Geotechnical Engineering in Taiwan and Hong Kong, 97-136. Wright S. G. (1969). A study of slope stability and the undrained shear strength of clay shales, Ph.D. Dissertation, University of California, Berkeley. Wu T. H. (2008), Reliability analysis of slopes, Reliability based design in geotechnical engineering: Computations and Applications, Eds Phoon K.K., London, Taylor and Francis, 413-447. Wu Q., An Y. and Liu Q. Q. (2015a), SPH-Based Simulations for Slope Failure Considering Soil-Rock Interaction, Procedia Engineering, 102:1842-1849. Wu Q., An Y. and Liu Q. Q. (2015b), A smoothed particle hydrodynamics method for modelling soil-water interaction, Procedia Engineering, 106:579-583. Wu Z. J., L. W. S., Ge X. R. (2009), Slope reliability analysis by random FEM under constraint random field. Chinese J Rock Soil Mech., 30(10):3086-92. Xing Z. (1988), Three-dimensional stability analysis of concave slopes in plan view, Journal of Geotechnical Engineering, ASCE, 114(6), 658–671. Yamagami T. and Jiang J. C. (1996), Determination of the Sliding Direction in Three-Dimensional Slope Stability Analysis, Proceedings of the 2nd International Conference on Soft Soil Engineering, Vol. 1, pp. 567–572, Nanjing, May. Yamagami T. and Jiang J. C. (1997), A search for the critical slip surface in three- dimensional slope stability analysis, Soils and Foundations, 37(3), 1–16. Yi P., Wei K. T., Kong X. J. and Zhu Z. (2015), Cumulative PSO-Kriging model for slope reliability analysis, Probabilistic Engineering Mechanics, 39:39-45. Yu H. S., Sloan S. W. and Kleeman P. W. (1994), A quadratic element for upper bound limit analysis, Engineering Computations, 11, 195–212. Yu H. S., Salgado R., Sloan S. W. and Kim J. M. (1998), Limit analysis versus limit equilibrium for slope stability, Journal of Geotechnical and Geoenvironmental Engineering, ASCE, 124(1), 1–11. Zhang X. (1988), Three-dimensional stability analysis of concave slopes in plan view, Journal of Geotechnical Engineering, 114, 658–671. Zhang X. (1999), Slope stability analysis based on the rigid finite element method, Geotechnique, 49(5), 585–593. Zhang J., Zhang L. M. and Tang W. H. (2011), New methods for system reliability analysis of soil slopes, Canadian Geotechnical Journal, 48(7):1138-1148. Zhang J., Huang H. W. and Phoon K. K. (2013), Application of the Kriging-Based Response Surface Method to the System Reliability of Soil Slopes, Journal of Geotechnical and Geoenvironmental Engineering, ASCE, 139(4):651-655. Zhao Y. G. and Ono T. (1997), An empirical reliability index based on SORM, Proceedings of 7th International Conference on Structural Safety and Reliability, Kyoto, Japan, 587-594. Zhao Y. G. and Ono T. (1999a), New approximations for SORM: Part 1, Journal of Engineering Mechanics, 125(1): 79-85. Zhao Y. G. and Ono T. (1999b), New approximations for SORM: Part 2, Journal of Engineering Mechanics, 125(1): 86-93. Zheng H., Zhou C. B. and Liu D. F. (2009). A robust solution procedure for the rigorous methods of slices. Soils and Foundations 49(4): 537 – 544. Zheng H. and Tham G. (2009), Improved Bell's method for the stability analysis of slopes, Journal of Geomechanics, ASCE, 33: 1673-1689. Zheng H. (2012). A three‐dimensional rigorous method for stability analysis of landslides. Engineering Geology 145: 30-40. Zhu D. Y., Lee C. F., Qian Q. H., Zou Z. S. and Sun F. (2001), A new procedure for computing the factor of safety using the Morgenstern–Price’s method, Canadian Geotechnical Journal, 38(4), 882–888. Zhu D. Y., Lee C. F. and Jiang H. D. (2003), Generalised framework of limit equilibrium methods for slope stability analysis, Geotechnique, 53(4), 377-395. Zhu D. Y., Lee C. F., Qian Q. H. and Chen G. R. (2005), A concise algorithm for computing the factor of safety using the Morgenstern–Price method, Canadian Geotechnical Journal, 42(1), 272–278. Zienkiewicz O. C., Humpheson C. and Lewis R. W. (1975), Associated and non- associated visco-plasticity and plasticity in soil mechanics. Geotechnique, 25(4), 671–689. Zienkiewicz O. C. and Zhu J. Z. (1992a), The superconvergent patch recovery and a-posteriori error-estimates. 1. the recovery technique, International Journal for Numerical Methods in Engineering, 33(7), 1331-1364. Zienkiewicz O. C. and Zhu J. Z. (1992b), The superconvergent patch recovery and a-posteriori error-estimates. 2. error-estimates and adaptivity, International Journal for Numerical Methods in Engineering, 33(7), 1365-1382. Zienkiewicz O. C. and Taylor R. L. (2005), The finite element method, Oxford; New York: Elsevier/Butterworth-Heinemann. Zolfaghari A. R., Heath A. C. and McCombie P. F. (2005), Simple genetic algorithm search for critical non-circular failure surface in slope stability analysis, Computers and Geotechnics, 32(3), 139–152. Zouain N., Herskovits J., Borges L. A. and Feijoo R. A. (1993), An iterative algorithm for limit analysis with nonlinear yield functions, International Journal of Solids and Structures, 30(10), 1397-1417. This book targets final year degree students, post-graduates to professional engineers. There are materials suitable for each group of readers.